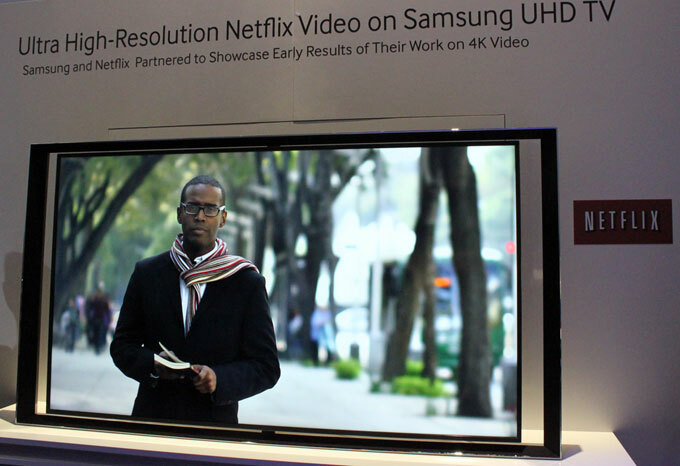 The TV industry is already pushing for Ultra HD / 4K, which is the next step after Full HD. But what does it actually mean for our TVs, media boxes, movies and games? FlatpanelsHD explains why Ultra HD is important and why there is much more to it than just higher resolution. Ultra HD is the future. The article is technical at times but we will summarize the key points at the end. You probably remember when flat panel TVs started appearing in stores and TV makers started talking about HD and a new world of amazing details and immersive movies, TV shows and games. At that time we came from SD (Standard Definition, most often 720x480 or 720x576 pixels) so it was a quite big step forward. Full HD has 1920x1080 pixels. Ultra HD in 4K has 4 times more pixels than Full HD. 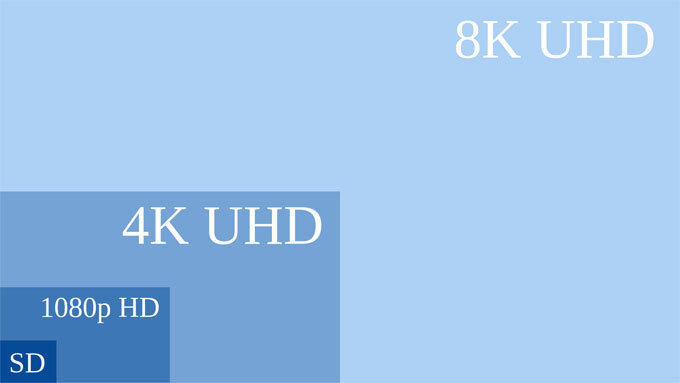 Ultra HD in 8K has 16 times more pixels than Full HD. Today, the TV industry supports two HD formats; often referred to as 720p (1280x720 pixels) and 1080p (1920x1080 pixels, Full HD). 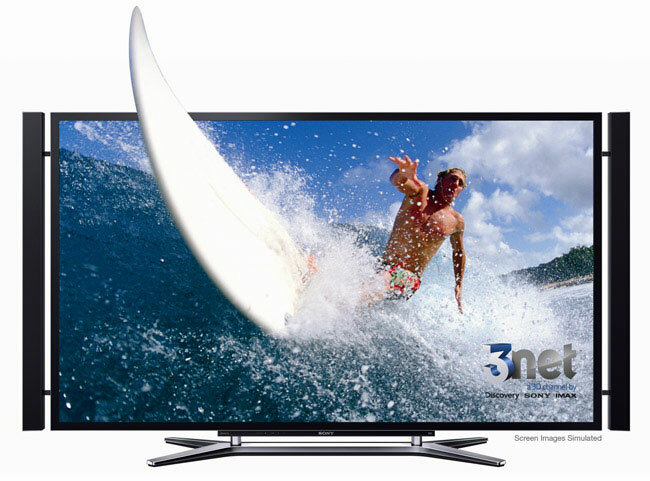 All our HDTVs come with Full HD resolution but content – movies, TV shows, games etc. – is 720p in many cases. There are, in other words, two sides of the equation: our screen and the content. Both are important but the truth is that content is often the bottleneck. Here is a short overview of the typical resolution classes for content. Ultra HD is the next step on the resolution ladder. 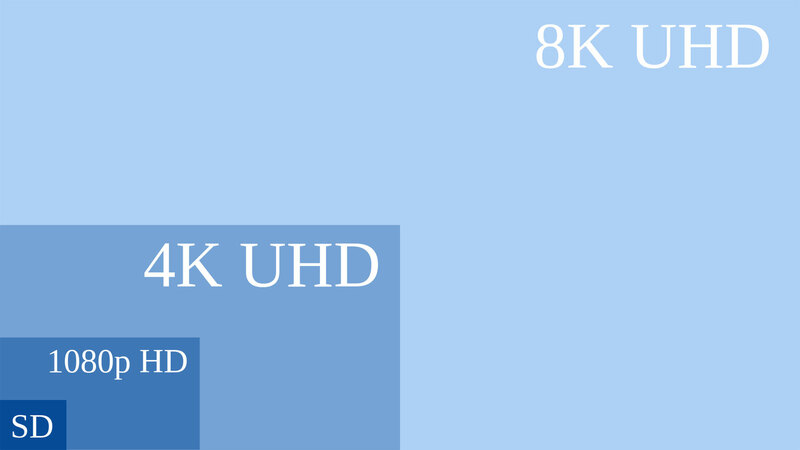 It also goes by the name UHD or 4K (4K is actually a movie theatre format but the name is often used for Ultra HD). Just like the HD standard, which covers both 720p and 1080p, Ultra HD covers 4K (also called 2160p) and 8K (also called 4320p). As you might have noticed by now the naming methodology is not straightforward and the industry likes to refer to things in different fashions. Again we can offer a roughly outlined overview. The difference in pixel resolution is quite significant and can best be illustrated like this. So, that was pixel resolution. Let’s move on. In the last section we told you what Ultra HD is, measured in pixels. But the Ultra HD standard covers more than resolution. Ultra HD was recently approved as the official name, and in the latest BT.2020 recommendation from ITU (who is responsible for the standards) other exciting elements are included. With Ultra HD it has also been proposed that we increase “frames per second” (often referred to as frequency, Hz or fps). We need to once again look at the history of fps to understand the future. Today, pretty much all Hollywood movies are shot at 24 fps (24 new pictures per second) and TV programs at 25 fps or 30 fps (25 pictures per second in PAL countries and 30 pictures per second in NTSC countries). Games are typically rendered at a frame rates between 30 and 60 fps on a game console and up to 120 fps on a PC. In other words; there is a huge difference between the frame rates; and therefore how smooth you will perceive motion. Ultra HD proposes that movies and TV programs can be recorded and reproduced at frame rates up to 120 fps; 120 pictures each second. Ultra HD will support 24, 25, 48, 50, 60 and 120 fps if the full recommendation is implemented in practice. If you have watched The Hobbit in HFR format you have experienced a movie shot in true 48 fps, and then you probably know what 48 can do for picture quality and the movie experience (read our thoughts on the The Hobbit in HFR here). The two coming Avatar movies will most likely be shot at 60 fps so we are not even close to 120 fps yet. Some movie producers even believe that a higher frame rate is a far greater improvement in picture quality than a step up in pixel resolution is right now. And yes, the move from 24 Hz to just 48 or 60 Hz is truly a small revolution in picture quality. But what about colors? Well, major improvements are proposed in this area, too. With Ultra HD a new color gamut called Rec.2020 is introduced. Today, we use the so-called Rec.709 color gamut for Full HD. Do not mind the names, as it is relatively simple. It is best illustrated with a graph. The human eye can only perceive a specific set of colors. We cannot perceive, for example, infrared (you cannot see the infrared light coming out of your TV remote) and there are other ”colors” that are invisible to us, too. The typical human eye can perceive all the colors illustrated in the color spectrum graph below. However, our TV screens, projectors and cameras cannot match all these colors so the industry has defined a smaller color gamut that movie folks and TV manufacturers can implement in products and productions; a color standard so to say. We need this standard to make sure that movie and TV productions appear correctly on our TV screens. In the graph above you can see both Rec.709 (used in the Full HD standard) and Rec.2020 (that can be used in Ultra HD). Rec.2020 is the larger of the two and as you can see Rec.2020 gives us many more colors to work with. It gives us a larger color gamut to pick colors from, so to say. So, therefore Ultra HD also proposes an extension of what is often referred to as color depth; an increase from the current 8-bit to 12-bit per color (and a change from 24-bit to 36-bit for all colors combined). 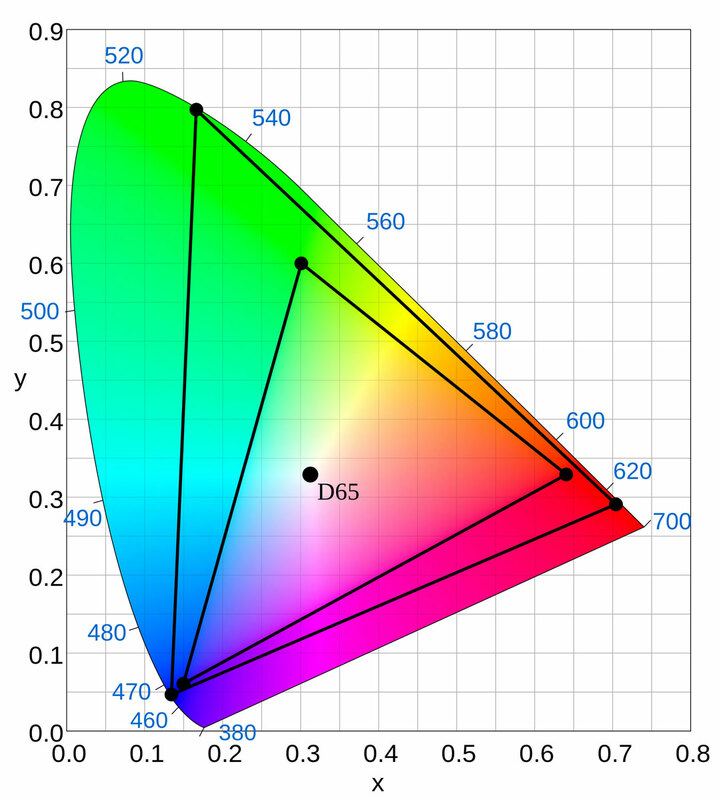 This may sound very technical but with the color gamut explanation in mind it is fairly easy to grasp. When a TV or camera uses 8-bit per color it means that it can define 256 shades (2^8 = 256) of red, green, and blue, respectively. These three colors are used as basic colors to create all other colors. In other words; it allows us to create 256 shades of red, 256 shades of green and 256 shades of blue. In total this gives us 24-bit or 16.777 million (256x256x256) colors. The 16.777 million colors can be “picked” from inside the color gamut defined in Rec.709 that is used today for Full HD. There is also a 10-bit level in the Ultra HD standard. A summary would look like this. We need to emphasize that Ultra HD displays, cameras and video productions do not necessarily have to take advantage of all the new, improved layers of colors and frames per second options but these elements can be utilized, if desired. As you might have guessed it places great demands on the equipment. An uncompressed video in 8K UHD with 120 fps and 36-bit colors requires 51.2 Gbit of uncompressed data running through a cable each second. It is obviously possible to compress video to much lower data levels but it is a massive amount of data we are talking about here. But how do I get Ultra HD? Lots of numbers have been thrown in the air up until now so let us take a more holistic view of how to get Ultra HD into our living rooms. TV manufacturers have started talking about Ultra HD – and 4K – TVs and players but a product is no fun without the content. We need movies, TV series, games and more to be produced in Ultra HD before we can start enjoying. This is where Hollywood and the game industry come into the picture (bad joke, sorry). The food chain can, roughly, be illustrated like this. So, Ultra HD has to be adopted in all links of the chain. The movie industry still often uses ”film” to shoot but have started moving to digital video cameras (such as the Red Epic used for The Hobbit). The RED cameras can offer some of the new Ultra HD picture elements – but not all of them. 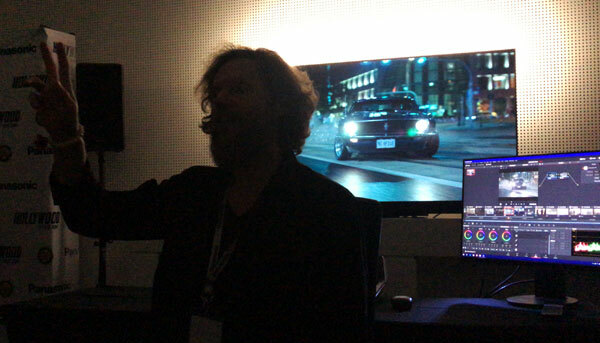 Most modern studios have been optimized for producing 4K for movie theatres and Full HD for consumers but they need to start working with deeper colors and higher frame rates during edited and mastering. This probably means that a lot of the studios will have to replace equipment, including their studio monitors. There needs to be a form of distribution; either a physical or digital highway. Blu-ray does not support Ultra HD. The internet can carry it but most consumers are connected through too slow connections. The TV – or projector – needs to support not only the Ultra HD resolution but also the extended color and fps elements to take full advantage of all the factors of the Ultra HD standard. The camera and studio stuff we leave to Hollywood but here on FlatpanelsHD we are obviously very interested in the last two links of the chain. The only side note we have regarding movie production is that many movies are already produced at resolutions higher than 4K so 2013 is different from the early 3D days. However, almost zero movies are produced with deeper color support and higher frame rates. So, we will see a lot of 4K conversions of older movies but they are not utilizing all of the wonders of the Ultra HD standard. We need new movies, shot with digital cameras for that. 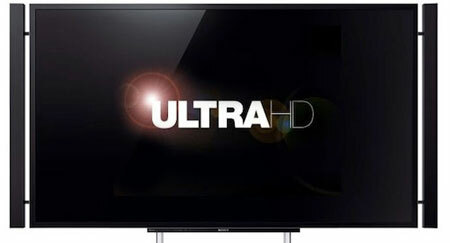 The distribution form will be covered in the next section but let us first round off with a quick note on some of the latest 2013 Ultra HD TVs. 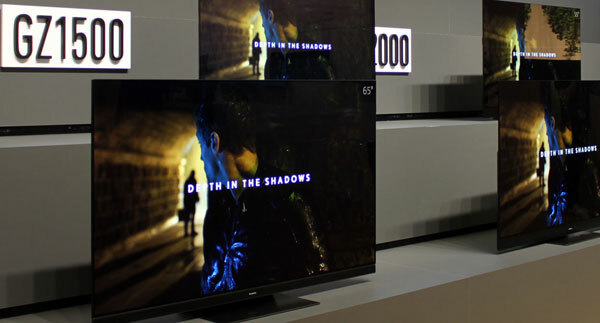 Ultra HD TVs are hitting markets these months with true 3840x2160 (4K) resolution. Most major TV brands are on the bandwagon, including Sony, LG, Sharp, Samsung and more. However, TV makers have not been able to answer a vital question at trade shows. Will these TVs also show 4K in 48 fps or 60 fps? And what about 4K with deeper colors? If the TVs do not support for example 4K in 48 fps you cannot enjoy The Hobbit as Peter Jackson and his team intended you to enjoy it. But there are more things to worry about. Join us in the next section. Soon we can buy impressive Ultra HD TVs for our living rooms. Prices are already starting to plummet, but price is not our biggest concern. Even if Hollywood starts working on 4K versions of catalogue titles the important question is how to get the beautiful pictures into our TVs? We are not talking about where or how to buy the 4K movies but simply how to input the signal into the TV. Right now we have the following issues. The distribution issue: Blu-ray supports none of the elements of the Ultra HD standard; neither 4K, nor higher fps, nor deeper colors. The connection issue: HDMI cannot move enough data. The current version of HDMI used in almost every TV can move 4K at 24 fps but not at 48 fps and not with deeper colors. And when you add 3D into the mix it gets even worse. The data issue: The current compression formats such as MPEG4 H.264 are not effective enough to support Ultra HD. All three issues have to be solved – simultaneously. There is a new HDMI cable standard in the works that will support at least 4K in up to 60 fps but that looks like a rather shortsighted solution. We must demand more. What about 120 fps, better colors, and 3D? The Blu-ray association has also started work on a 4K version of Blu-ray but it will most likely only support the low-level requirements of Ultra HD – again, a very shortsighted solution. We just replaced our 2D Blu-ray players with 3D Blu-ray players so who wants to buy a 4K Blu-ray player this year and a ”higher 4K” Blu-ray player again in 2-3 years? Instead, the industry has started talking about a world without physical media. A world where Blu-ray could fade out and disappear – it is not impossible to imagine. Blu-ray is already holding back the technological state of the market, so internet distribution and streaming has arisen as a better long-term alternative. The internet is more flexible as it can scale up much faster. But before we can even start talking about distribution of Ultra HD via the internet we need more effective compression. That applies even if the industry decides to bet on a physical format. This is where H.265 compression (also called HEVC) comes into play. H.265 is a new compression technology for mpeg4 video, and the successor to the widely-used H.264 that enabled us to enjoy HD and video back when it was adopted. Just like H.264 brought us into a new era, H.265 is expected to do the same for Ultra HD and offer better video streaming via the internet to TVs and mobile devices. One of the clear advantages of video streaming via the internet is that it can – theoretically – allow us to ditch a physical format AND the HDMI cable. You could, theoretically, just have a TV with an Ethernet plug – or even a TV connected via WiFi – where you could stream everything directly into the TV without cables, boxes etc. Or you could have a box connected wirelessly to your TV that would circumvent the requirement for a HDMI cable. At least that is the vision. The alternative is to use a box with a HDMI cable running to the TV like we do today but that would require a new HDMI standard and then we must return to a discussion of the issues stemming from the limited bandwidth of HDMI. We will soon publish an in-depth article about video compression, including H.265, so stay tuned. It is a new format war but this time it is not a war of two physical formats. It is not a new VHS vs. Betamax or Blu-ray vs. HD-DVD war. This time we have two completely different distribution forms, with Blu-ray; a physical format of discs in one ring corner and internet streaming; a virtual highway that is invisible in the other ring corner. This format war has already raged for many years already without most of us noticing it as it has had at least one intangible contender. The winner is not necessarily the one that offers the best picture quality right here and now but the one with the most promising perspectives. And it is hard to argue Blu-ray’s case – unless something drastic happens. We hope that our in-depth article has given you insight into the technical aspects of Ultra HD, as well as the prospects and immediate challenges. As you have seen the Ultra HD standard is about much more than just pixel resolution. Debaters who argue that Ultra HD is irrelevant forget that the format not only brings more pixels to the table but also offers significant improvements in motion due to higher frame rates and significant improvements in colors due to a wider color gamut and deeper color support. 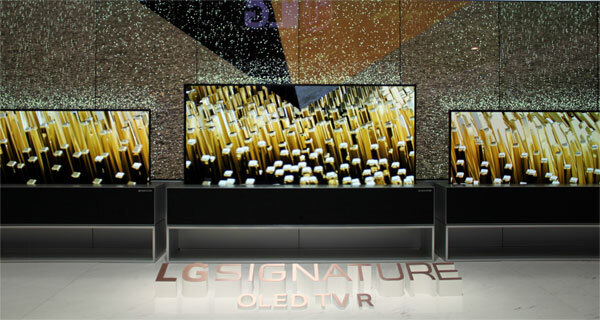 It is an undisputed fact that a large display or canvas is required to take full advantage of the resolution that Ultra HD offers – for both 4K and 8K – but some of the other advantages can easily be enjoyed on much smaller every-day TVs. Are you ready for Ultra HD? Ready for the next era in TV entertainment? One can blame Ultra HD for its extreme requirements that forces us to upgrade players, cables and TVs. One can blame Ultra HD for its requirements that force us to think about better compression technology and new distribution forms. But in perspective it is hard to blame Ultra HD for anything else than the introductory price range of the first-generation products, because the standard itself is ambitious and promising. Instead, we think that we should applaud Ultra HD and be excited about the new possibilities that will lead to improvements in players, TVs, compression, formats and much more. All combined, it will take entertainment to the next level. You can either meet it with a positive mind or a negative attitude. We are excited about it, that is for sure. But we are also realists and we are not convinced that it is a clever decision to buy one of the first Ultra HD products to become available. Right now there are too many unanswered questions. 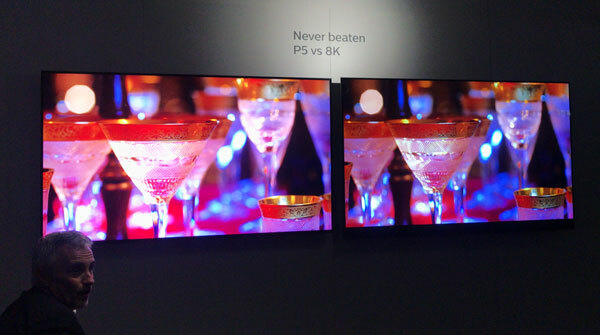 Will the first Ultra HD TVs support 4K at 48 or 60 fps? What about 3D and deeper colors? Can we feed them with 4K via HDMI and what about 4K via streaming? Is such a chip implemented? Etc. Until we get some clarification we can only recommend that you remain hesitant. This is really not the classic discussion about being open and trying something new. This is about not having to be a beta tester. We are convinced that in a few years’ time Ultra HD TVs will become much more affordable and mainstream. In a few years we can also answer some of the questions. When that time comes it will be exciting times in the TV industry.